On both islands we visited, Big Island and Maui, we rented an SUV for our trip. 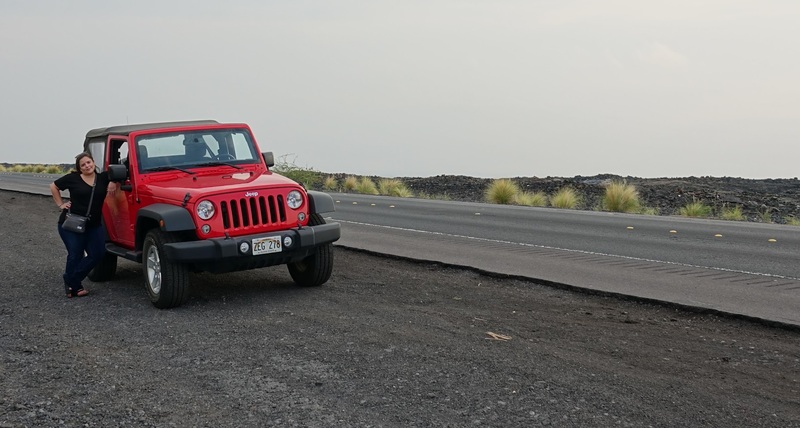 This was a bit on the pricey side, but we knew we wanted to do some gravel road driving on Mauna Kea and the Road to Hana, so we figured it was best to pay a little extra and get cars that could handle a few bumps. As it turns out, that was a smart move. The 4WD on the Wrangler came in handy a couple of times. For me, Hawaii was a joy to drive. It has a unique and captivating combination of fun, winding mountain roads and breathtaking ocean scenery. There are surprises and amazing vistas at every turn, you don’t really get bored of driving and spending time in the car. There are also plenty of opportunities to pull over, stretch your legs and do a little side exploration. As an example, the Chain of Craters road in Volcanoes National Park is a 40-mile (65km) round-trip drive that takes you from the top of Kilauea all the way down to the ocean and back up. Revealing Hawaii’s amazing volcanic landscape along the way. The drive feels completely different both ways, and there was so much to see at each turn. This time lapse video will give you an idea, although it is impossible to capture it all. The other really amazing drive was the all day trip around Mt. Haleakala, also known as the Road to Hana. We drove the loop tour, which was about a total of 150 miles (240km) from our apartment. The whole drive, with frequent sightseeing stops, took us about 12 hours, and was comprised of mostly twisty and narrow mountain roads, a lot of one-lane bridges, a dozen or so miles on bumpy gravel, and tons of amazing views, waterfalls and things to explore. In fact, we had to skip a couple very well known spots, simply because we didn’t have enough time. Definitely a drive I want to do again, with new stops along the way. 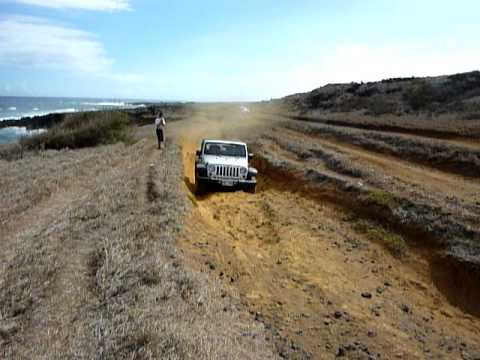 The 4WD of the Wrangler really came in handy on two occasions: Mauna Kea and Green Sand Beach. Part of the way up to Mauna Kea is a steep gravel road, and the park rangers require all cars to be 4WD vehicles, capable of a 4WD-Low gear setting. 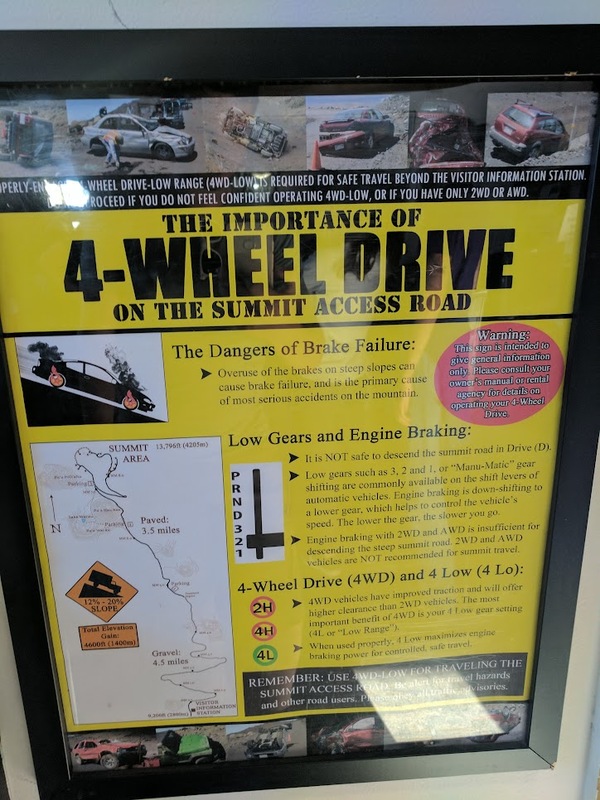 While the road was pretty well graded, the steepness (20%+) of the descent could easily kill your brakes if you don’t know how to use your low gears to engine brake and keep a steady speed on the way down. Green Sand Beach is a pretty remote location, and there is no official road to get there, so if you want to drive all the way there, you need to go fully off-road. This was fun for a while, but a bit nerve wracking in a rental car. The terrain was quite demanding for someone who had never done serious off-roading, and we ended up only going part of the way there. The ‘track’ to Green Sand Beach. Not my photo, but you get the idea. 2WD cars need not apply. As I said earlier, driving around Hawaii was a lot of fun and a great experience. It was great to get away from all that New York City and I-95 traffic, and drive some routes that were not just miles and miles traffic jams or 6-lane highways.